Dunedin, FL., November 15, 2014 — When it was time to named the MVP, there was no hesitation from manager John Ramsey. “It’s Jeff Salay — he’s the MVP, for sure,” Ramsey said. 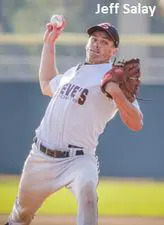 That’s because Salay pitched a three-hit complete game to lead Cleveland Steve’s Sports to its first +25 Open Championship on Saturday morning at Florida Auto Exchange Stadium with a 4-1 win over the Long Island Sun Devils. “I wanted to go the distance today and (catcher) Charlie (Wrightsel) did a great job behind the plate today,” Salay said. “I had a great defense behind me and it feels really good to get my first championship and do it this way.” Salay would strike out ten, walk four and give up an earned run in the ninth, this on the heels of pitching seven innings and striking out eight Monday vs. Long Island, as well. Jake Plata hit a two-run, two-out homer in the bottom of the third for a 2-0 lead that Cleveland would never relinquish. Ramsey would tack on a run with an RBI double in the seventh, which also came on two outs. Salay did get into a little trouble in the ninth after a bloop single and walk, then an RBI single by Dom Gorecki gave the Sun Devils their lone run. Salay would pitch around it and strike out Kevin McNulty to end the game.